If I was Iceman, I would quit the team the moment Sunfire joins. It's inevitable that one day those powers are going to be used, well... like they were in X-Men: Days of Future Past, so get out while the going's good I say. 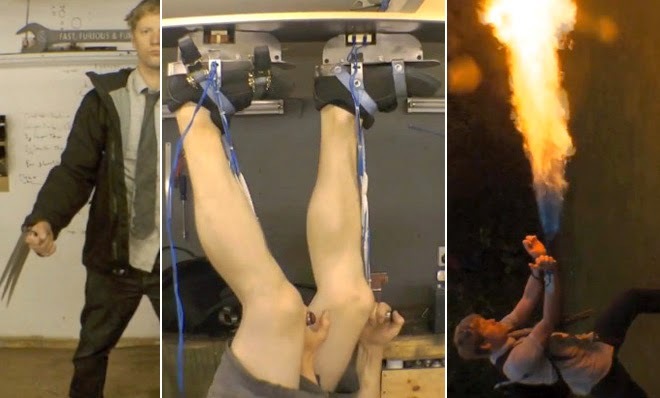 One guy who doesn't know the meaning of the word 'quit' however is Colin Furze. He's the 'Forge' who has created automatically extending and retracting Wolverine claws, and boots that allow you to walk on the roof like Magneto would if he didn't fly around so much. Done with the metallic based heroes, he has now turned his attention to Sunfire/Pyro/anyone who does flame, and created these wrist mounted flamethrowers, sure to make shovelling the driveway a hell of a lot easier at a ski season near you. 12ft of flames! Crikey that's like four Puck's long. Still, I'll give him full jaw-dropping credit when the retractable Archangel wings are invented. Without nasty soul-crushing Apocalypse torture component of course.